Local philanthropist collective, The DVSH Partnership, in conjunction with the not-for-profit organization, Veterans for Peace, have joined forces to host RESTORING VALOR, a fundraiser for the Deported Veterans Support House of Tijuana. 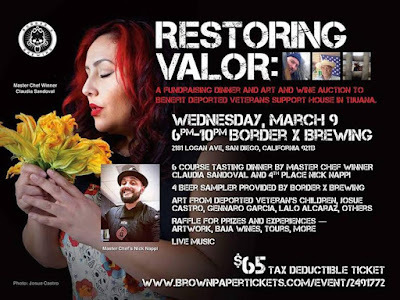 Taking place Wednesday, March 9, starting at 6pm at Border X Brewing in Barrio Logan, the event will celebrate the cross-cultural influences of San Diego and Baja within the genres of dining and arts, while focusing awareness of and raising much needed funds for U.S. veterans who have been deported following military service. The Deported Veterans Support House, commonly referred to as “The Bunker”, serves as a landing spot in Tijuana for honorably discharged veterans of the various branches of U.S. military who have been deported for offenses as minor as marijuana possession in the aftermath of their service. The Bunker receives support and volunteer assistance from many veteran organizations in the United States, including The Veterans for Peace, under whose 501(c)(3) designation this event is being hosted. Restoring Valor hopes to raise the funds necessary to purchase a van for the Deported Veterans Support House, which is necessary for transporting U.S. resident veteran volunteers from the border to the facility, as well as transporting donations, and oftentimes disabled deported veterans to their various appointments and interviews. Additionally, the event hopes to raise enough funds to pay rent on the facility for a term of one-year, allowing organization heads to concentrate their efforts on the work necessary to petition for corrective legislation and individual appeals. Restoring Valor will bring together a collective of artists, chefs and various business owners from both sides of the border, and will welcome special guest City Councilman, David Alvarez, in support of America’s forgotten heroes. The event will take place at David Favela’s Border X Brewing in Barrio Logan. Local celebrity, Master Chef television show Season 7 winner, Claudia Sandoval and 4th place runner-up, Nick Nappi, will bring Baja to the plate with a 6-course tasting. Aside from the venue, Border X is offering a four-beer tasting flight with each ticket, as well as 10% of beer sales during the evening. Also included in the price of the ticket is a viewing of the Perspectives in Art exhibit - a collection of art created by our deported heroes and their U.S. resident children, from whom their circumstance currently has them separated. In addition to the exhibit, opportunity drawings and door prize drawings will continue throughout the evening, as will a silent auction with items donated by renowned artists, chefs and Baja wineries. Items up for bid include a private on-site dinner by award winning paella chef, Carlos Cervantes; an overnight stay and gourmet farm-to-table dinner at Baja wine country Valle de Guadalupe’s Casa Mayoral; and an offering from local celebrity chef Javier Plascencia that includes dinner at four of his most beloved restaurants. Renowned photographer Josue Castro, whose pieces have traveled the world and gained international celebrity, will be on hand to photograph guests in his signature style for a small stipend, which will also be donated to the Deported Veterans Support House. Tickets for the event are available on-line for $75 at brownpapertickets.com/event/2491772.